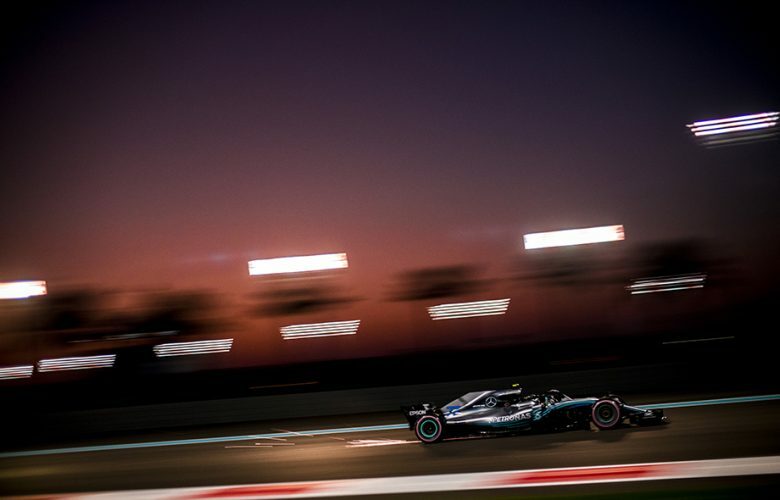 Moon raises over the circuit during previews for the Abu Dhabi Formula One Grand Prix at Yas Marina Circuit on November 22, 2018 in Abu Dhabi, United Arab Emirates. 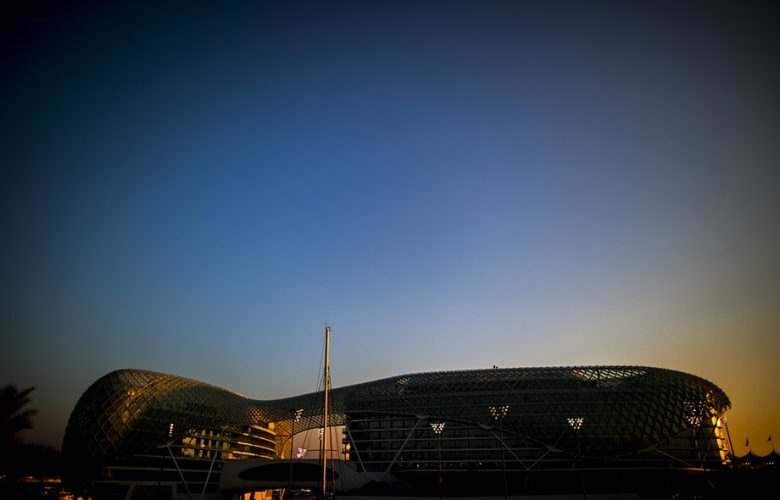 Sun goes down over the Yas Hotel during previews for the Abu Dhabi Formula One Grand Prix at Yas Marina Circuit on November 22, 2018 in Abu Dhabi, United Arab Emirates. 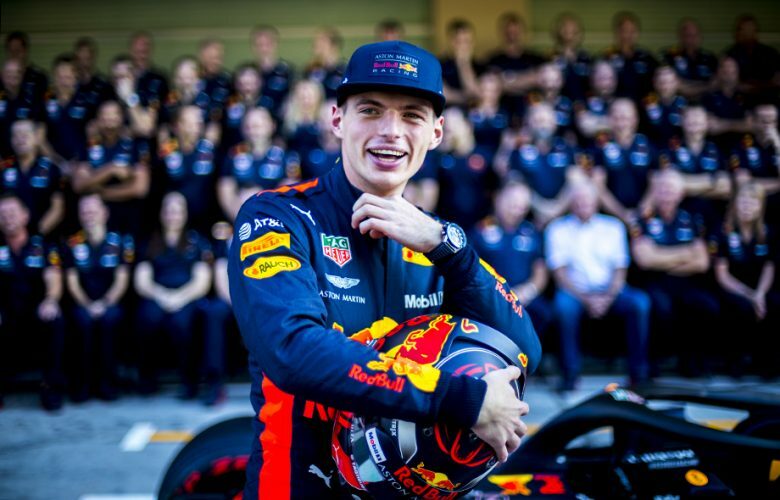 Max Verstappen of Netherlands and Aston Martin Red Bull Racing smiles during previews for the Abu Dhabi Formula One Grand Prix at Yas Marina Circuit on November 22, 2018 in Abu Dhabi, United Arab Emirates. 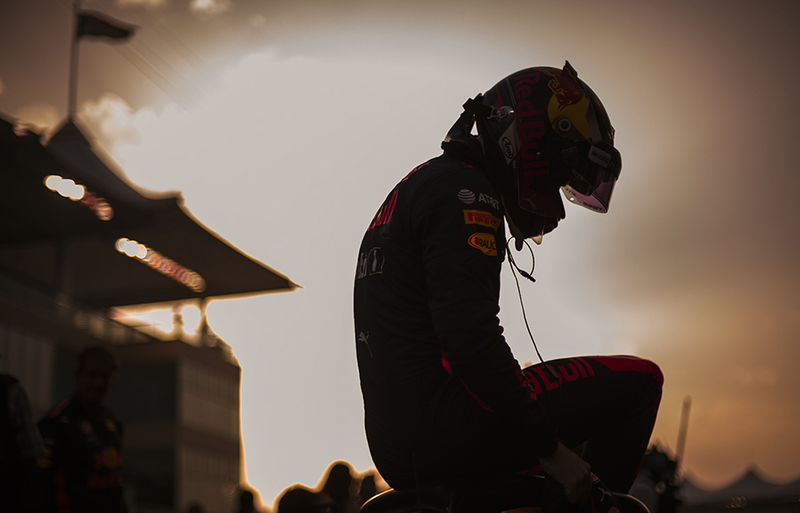 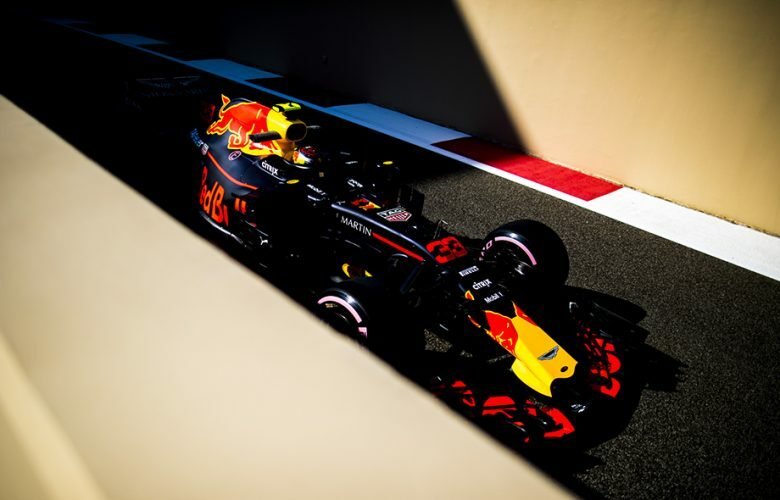 Max Verstappen of Netherlands and Aston Martin Red Bull Racing is seen during previews for the Abu Dhabi Formula One Grand Prix at Yas Marina Circuit on November 22, 2018 in Abu Dhabi, United Arab Emirates. 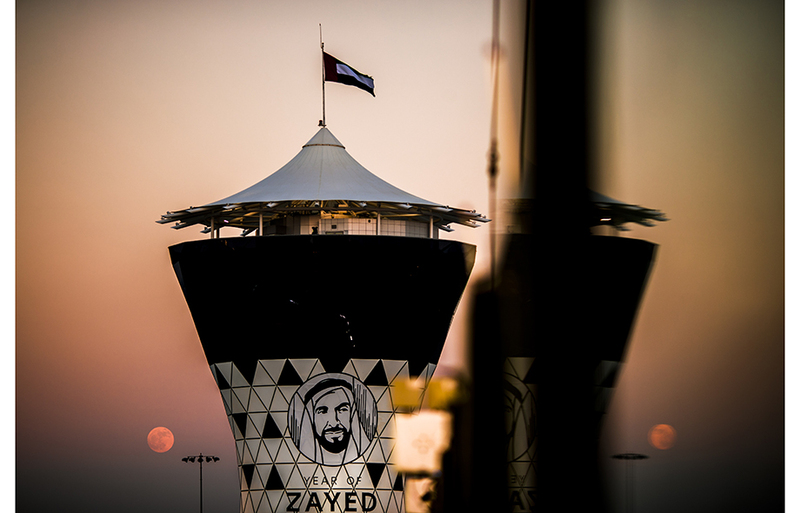 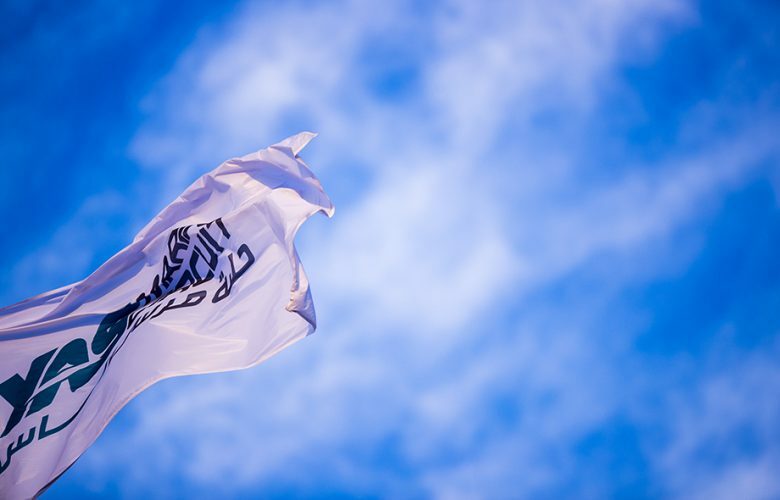 Yas Marina Circuit flag is seen during qualifying for the Abu Dhabi Formula One Grand Prix at Yas Marina Circuit on November 24, 2018 in Abu Dhabi, United Arab Emirates. 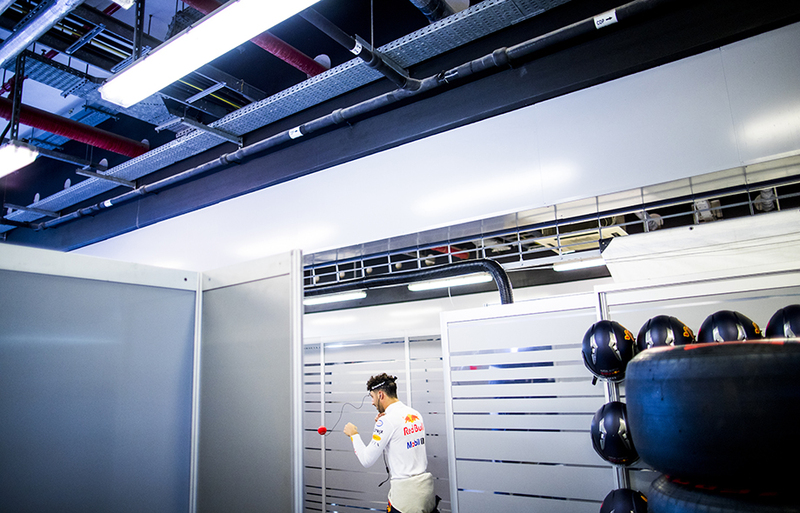 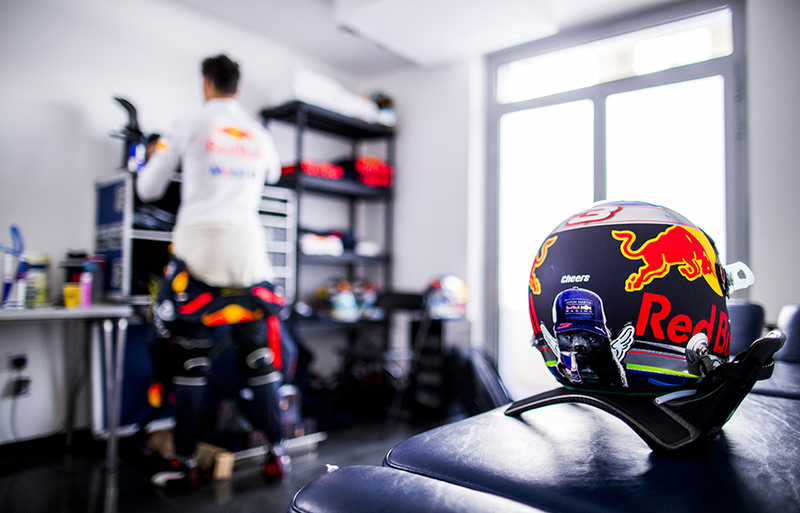 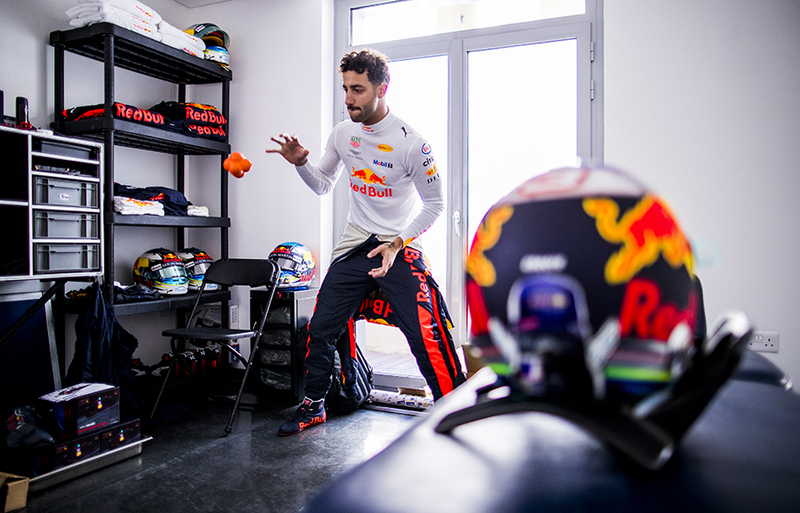 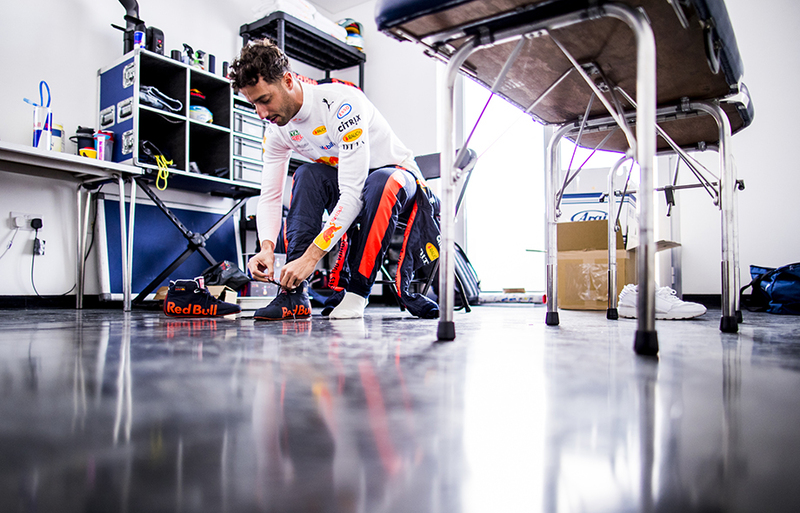 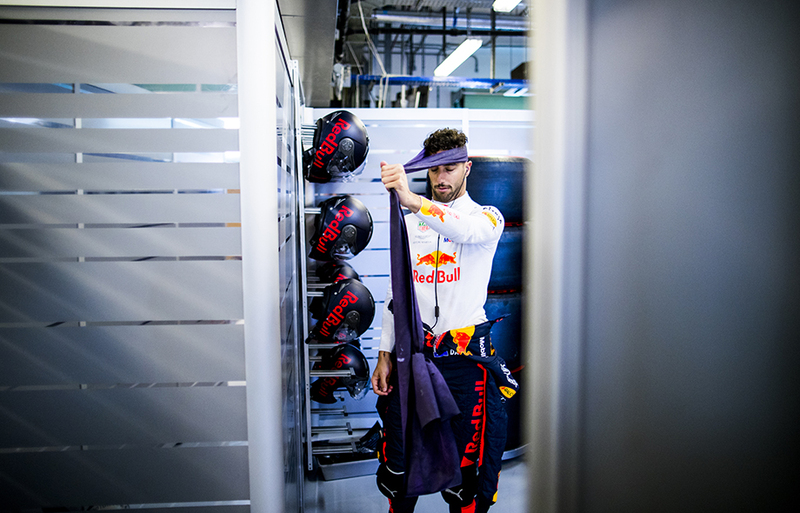 Daniel Ricciardo of Australia and Aston Martin Red Bull Racing prepares inside his changing room during practice for the Abu Dhabi Formula One Grand Prix at Yas Marina Circuit on November 23, 2018 in Abu Dhabi, United Arab Emirates. 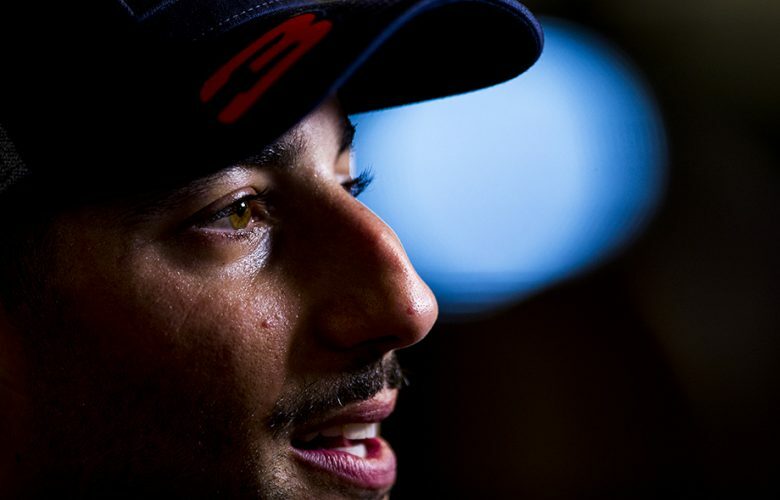 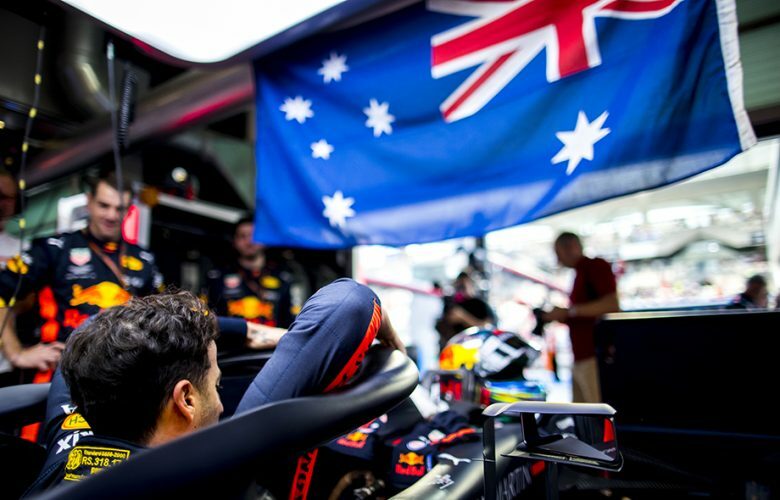 Daniel Ricciardo of Australia and Aston Martin Red Bull Racing is pictured during practice for the Abu Dhabi Formula One Grand Prix at Yas Marina Circuit on November 23, 2018 in Abu Dhabi, United Arab Emirates. 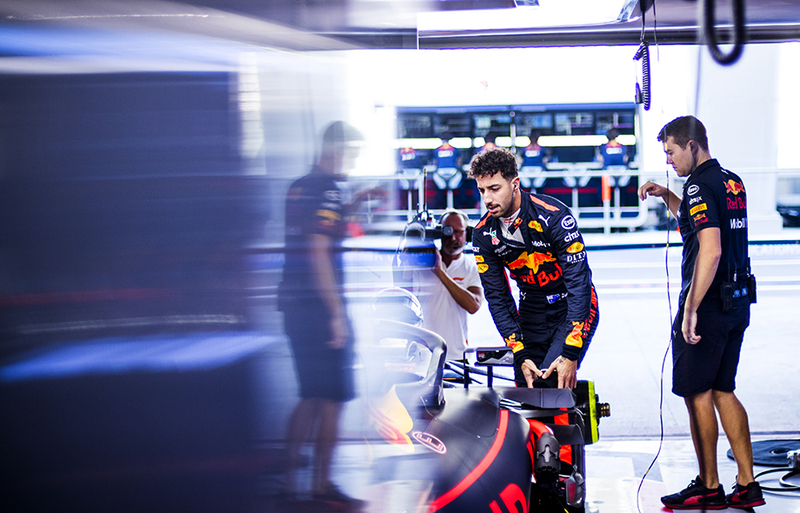 Daniel Ricciardo of Australia and Aston Martin Red Bull Racing inside the garage during practice for the Abu Dhabi Formula One Grand Prix at Yas Marina Circuit on November 23, 2018 in Abu Dhabi, United Arab Emirates. 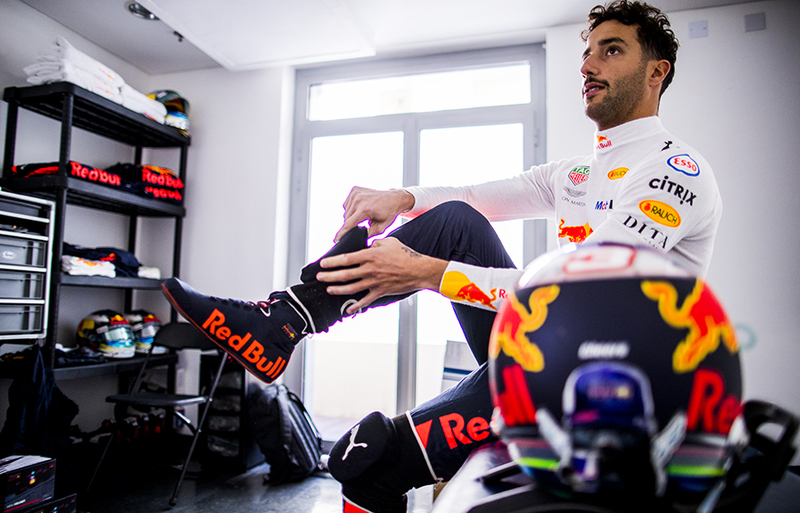 Daniel Ricciardo of Australia and Aston Martin Red Bull Racing prepares in the back of the garage during practice for the Abu Dhabi Formula One Grand Prix at Yas Marina Circuit on November 23, 2018 in Abu Dhabi, United Arab Emirates. 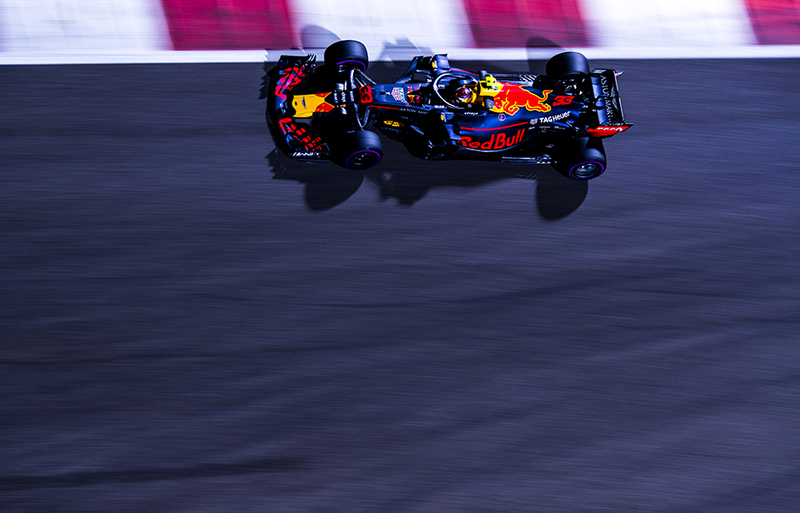 Daniel Ricciardo of Australia and Aston Martin Red Bull Racing drives his RB14 during practice prior qualifying for the Abu Dhabi Formula One Grand Prix at Yas Marina Circuit on November 24, 2018 in Abu Dhabi, United Arab Emirates. 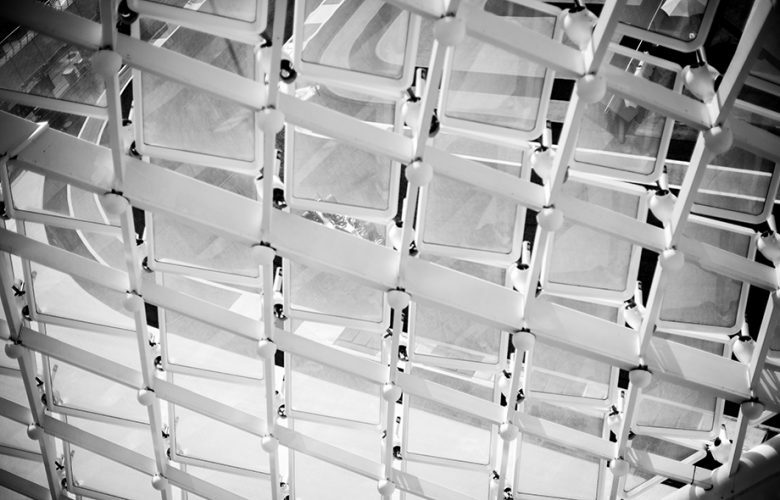 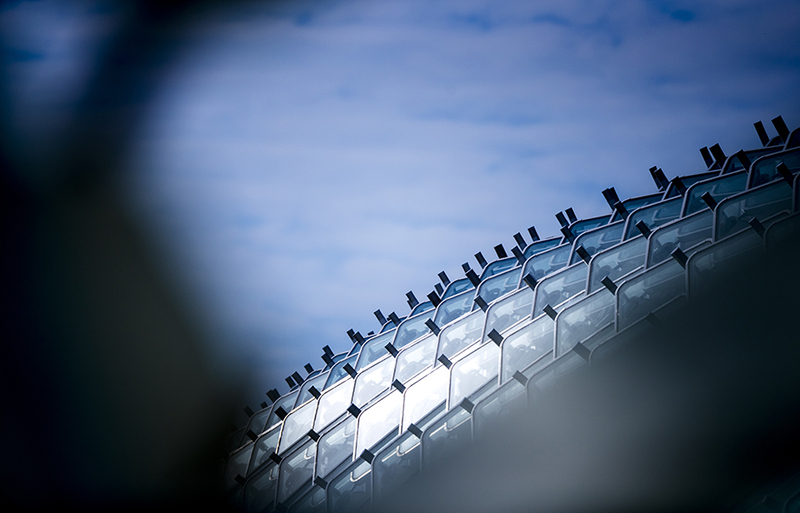 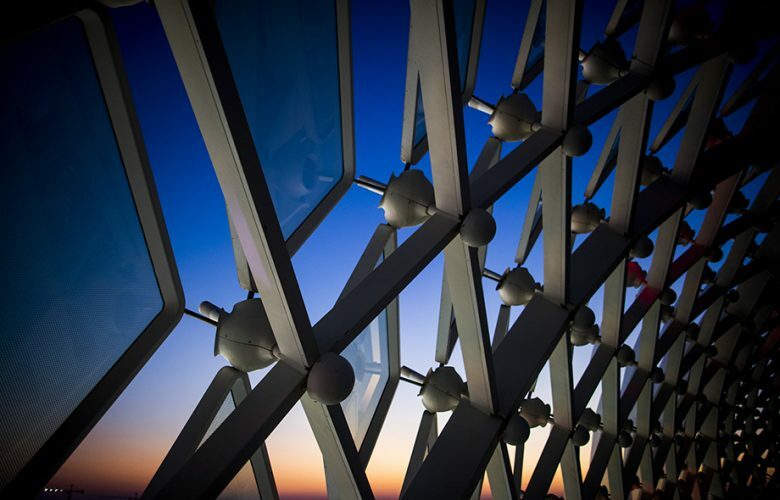 Roof of the Yas Hotel is pictured during practice prior qualifying for the Abu Dhabi Formula One Grand Prix at Yas Marina Circuit on November 24, 2018 in Abu Dhabi, United Arab Emirates. Lewis Hamilton of Great Britain and Mercedes AMG Petronas during practice for the Abu Dhabi Formula One Grand Prix at Yas Marina Circuit on November 23, 2018 in Abu Dhabi, United Arab Emirates. 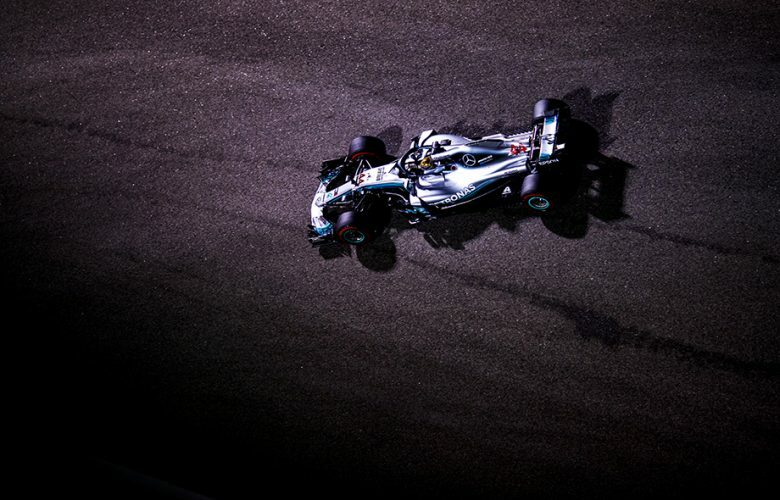 Lewis Hamilton of Great Britain and Mercedes AMG Petronas drives his W09 during practice prior qualifying for the Abu Dhabi Formula One Grand Prix at Yas Marina Circuit on November 24, 2018 in Abu Dhabi, United Arab Emirates. 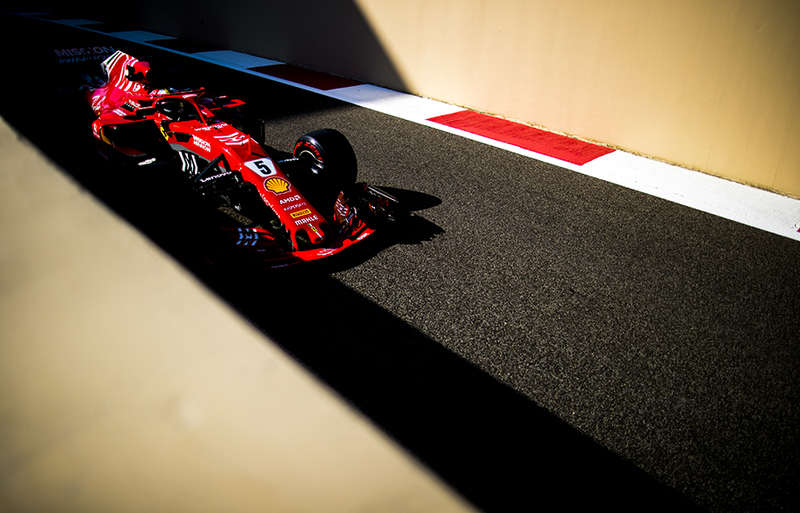 Sebastian Vettel of Germany and Scuderia Ferrari drives his SF71H during practice for the Abu Dhabi Formula One Grand Prix at Yas Marina Circuit on November 23, 2018 in Abu Dhabi, United Arab Emirates. 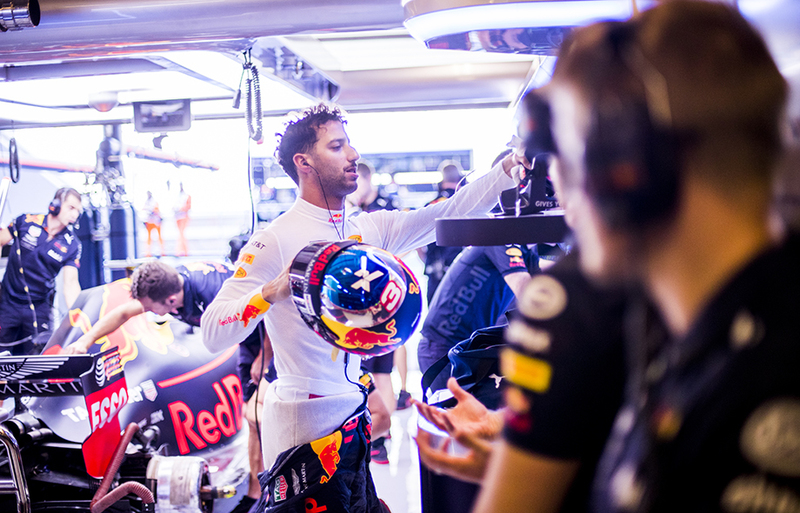 Daniel Ricciardo of Australia and Aston Martin Red Bull Racing and Max Verstappen of Netherlands and Aston Martin Red Bull Racing at start practice during practice for the Abu Dhabi Formula One Grand Prix at Yas Marina Circuit on November 23, 2018 in Abu Dhabi, United Arab Emirates. 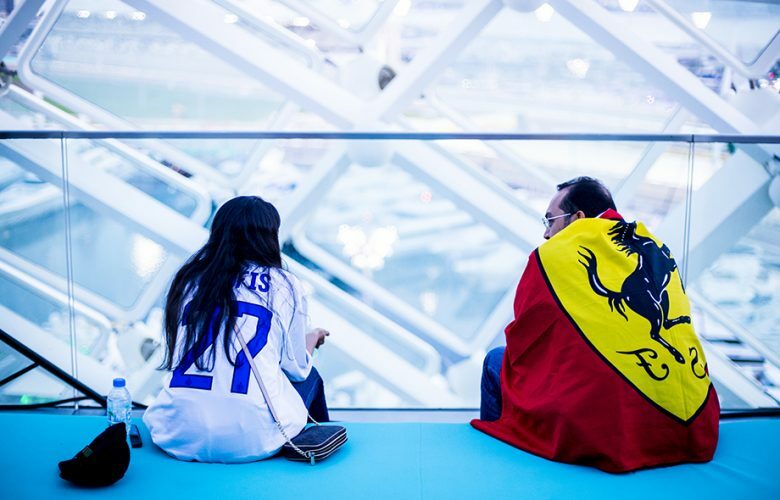 Ferrari fans are seen at the top of the Yas Hotel during practice for the Abu Dhabi Formula One Grand Prix at Yas Marina Circuit on November 23, 2018 in Abu Dhabi, United Arab Emirates. 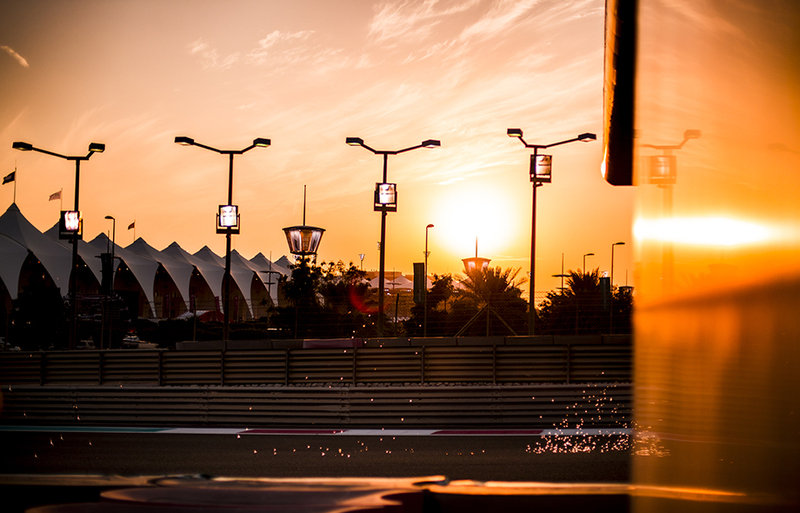 Sun goes down over the Yas hotel during practice for the Abu Dhabi Formula One Grand Prix at Yas Marina Circuit on November 23, 2018 in Abu Dhabi, United Arab Emirates. 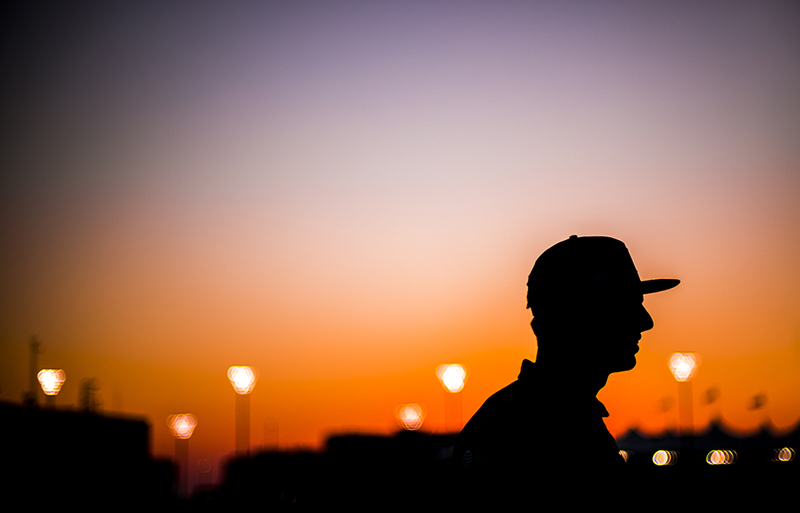 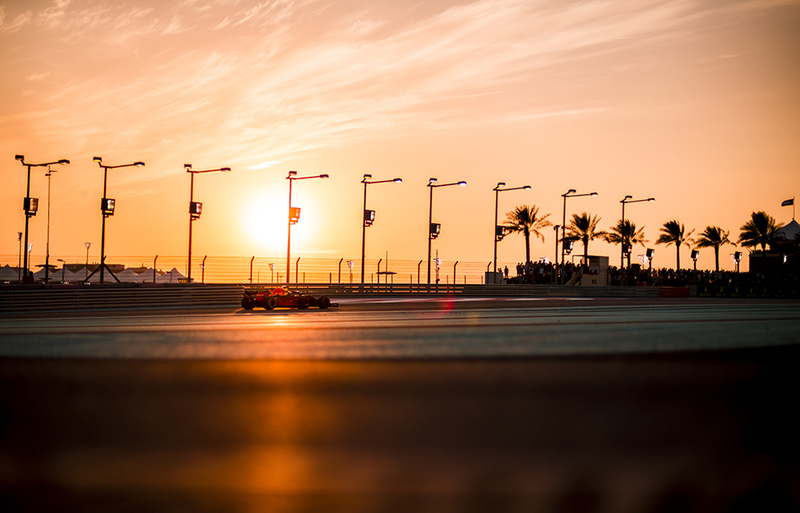 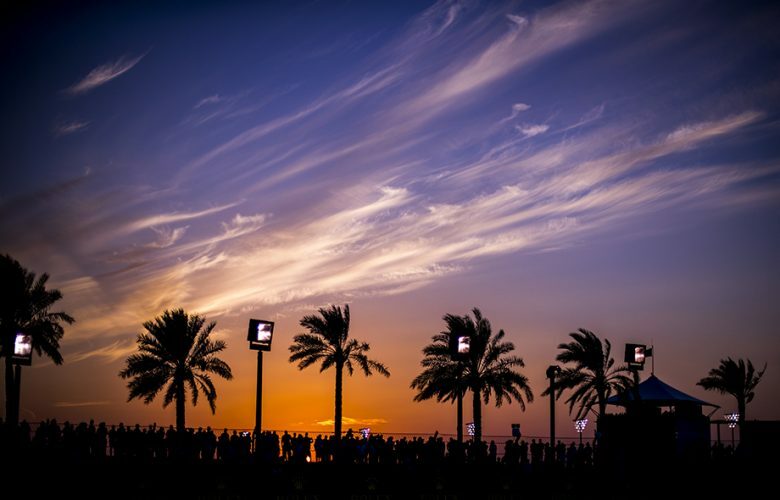 Sun goes down over the circuit during qualifying for the Abu Dhabi Formula One Grand Prix at Yas Marina Circuit on November 24, 2018 in Abu Dhabi, United Arab Emirates. Max Verstappen of Netherlands and Aston Martin Red Bull Racing drives his RB14 during practice for the Abu Dhabi Formula One Grand Prix at Yas Marina Circuit on November 23, 2018 in Abu Dhabi, United Arab Emirates. 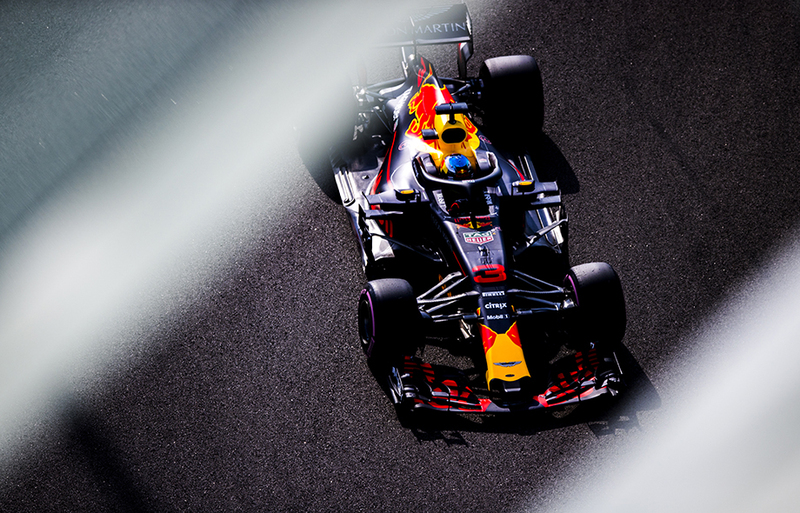 Daniel Ricciardo of Australia and Aston Martin Red Bull Racing drives his RB14 during practice for the Abu Dhabi Formula One Grand Prix at Yas Marina Circuit on November 23, 2018 in Abu Dhabi, United Arab Emirates. 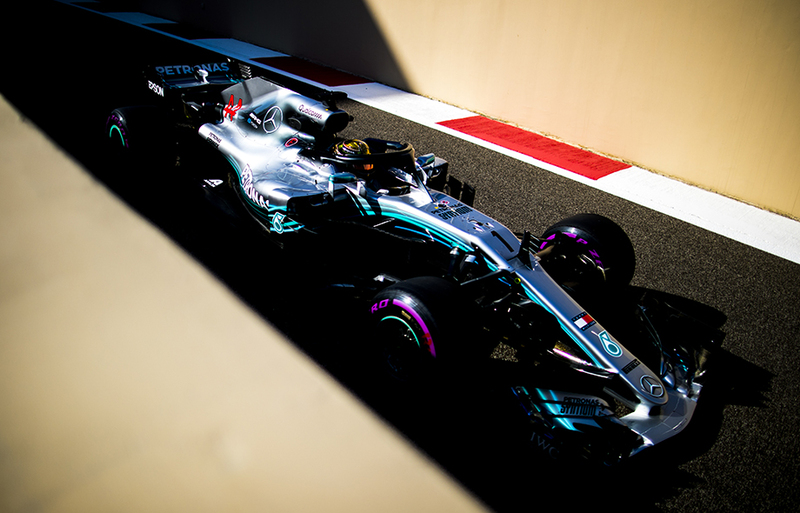 Lewis Hamilton of Great Britain and Mercedes AMG Petronas drives his W09 during practice for the Abu Dhabi Formula One Grand Prix at Yas Marina Circuit on November 23, 2018 in Abu Dhabi, United Arab Emirates. 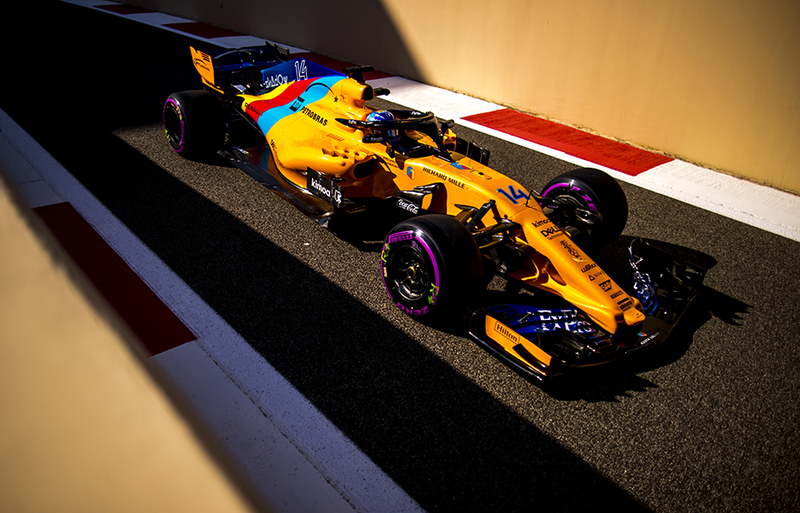 Fernando Alonso of Spain and McLaren drives his MCL33 during practice for the Abu Dhabi Formula One Grand Prix at Yas Marina Circuit on November 23, 2018 in Abu Dhabi, United Arab Emirates. 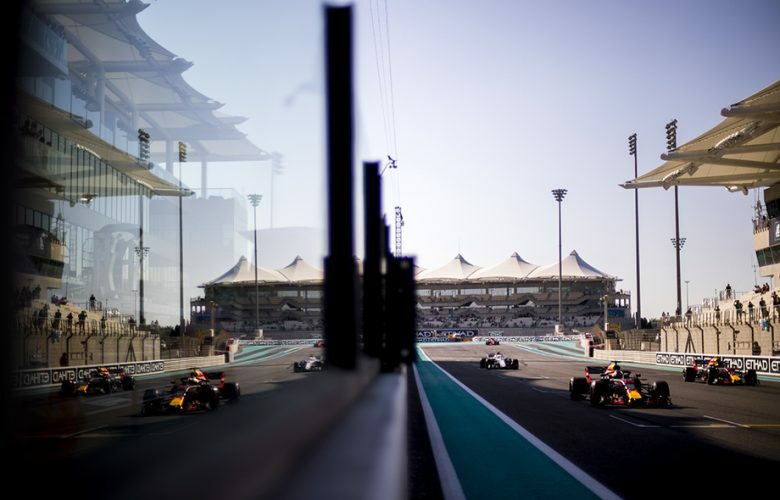 Daniel Ricciardo of Australia and Aston Martin Red Bull Racing is seen post qualifying for the Abu Dhabi Formula One Grand Prix at Yas Marina Circuit on November 24, 2018 in Abu Dhabi, United Arab Emirates. 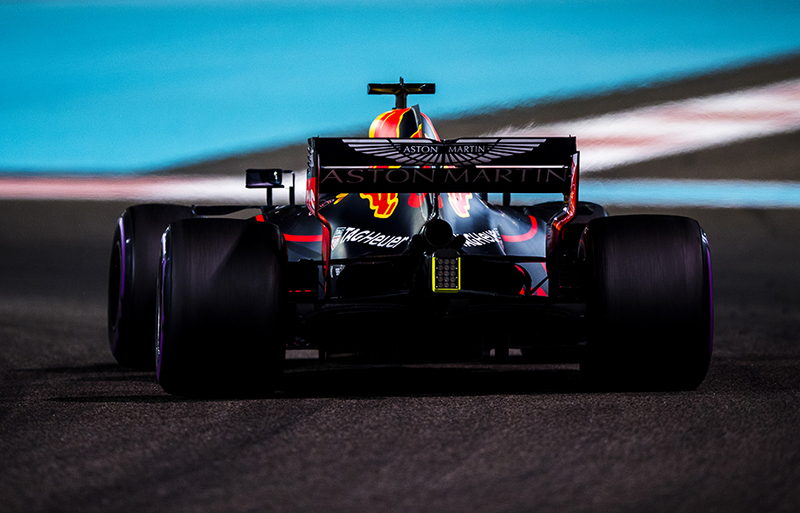 Max Verstappen of Netherlands and Aston Martin Red Bull Racing sparks his RB14 during qualifying for the Abu Dhabi Formula One Grand Prix at Yas Marina Circuit on November 24, 2018 in Abu Dhabi, United Arab Emirates. 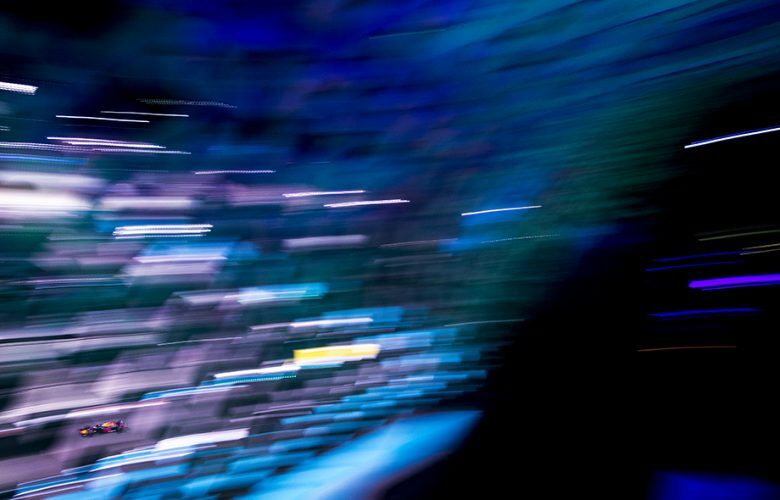 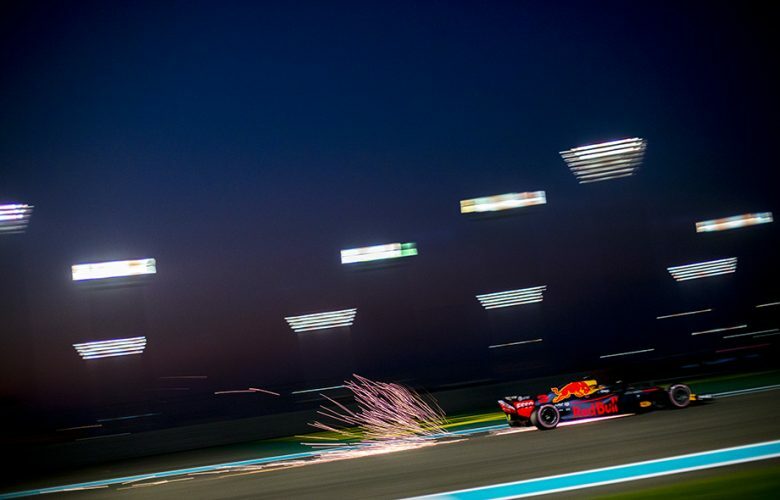 Sparks from the RB14 of Max Verstappen of Netherlands and Aston Martin Red Bull Racing are seen during qualifying for the Abu Dhabi Formula One Grand Prix at Yas Marina Circuit on November 24, 2018 in Abu Dhabi, United Arab Emirates. 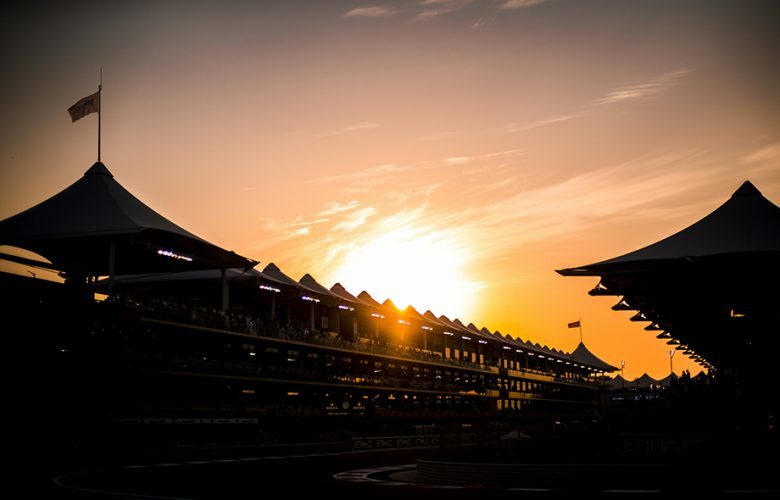 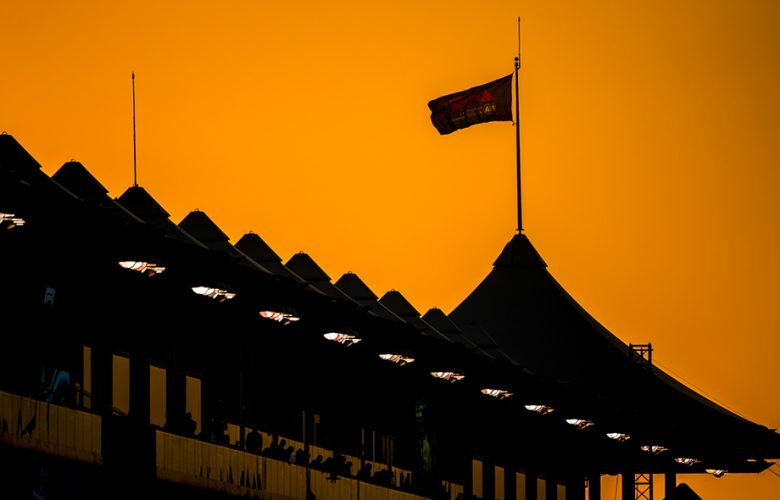 Sun goes down over the track during qualifying for the Abu Dhabi Formula One Grand Prix at Yas Marina Circuit on November 24, 2018 in Abu Dhabi, United Arab Emirates. 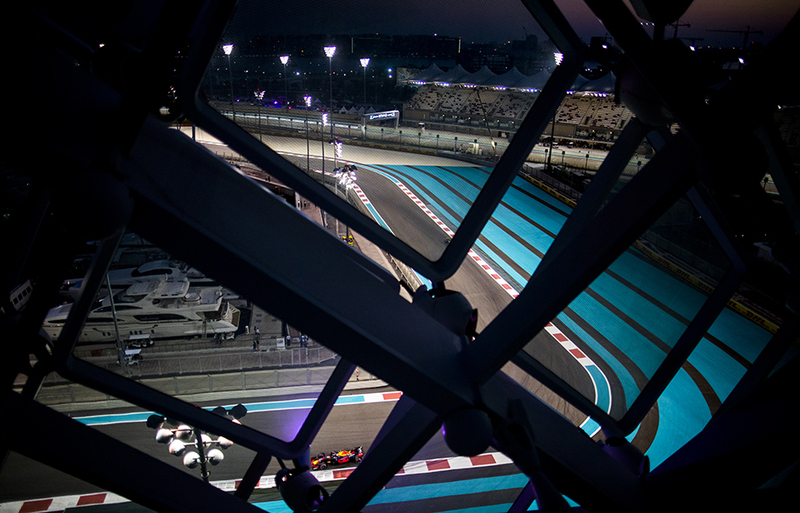 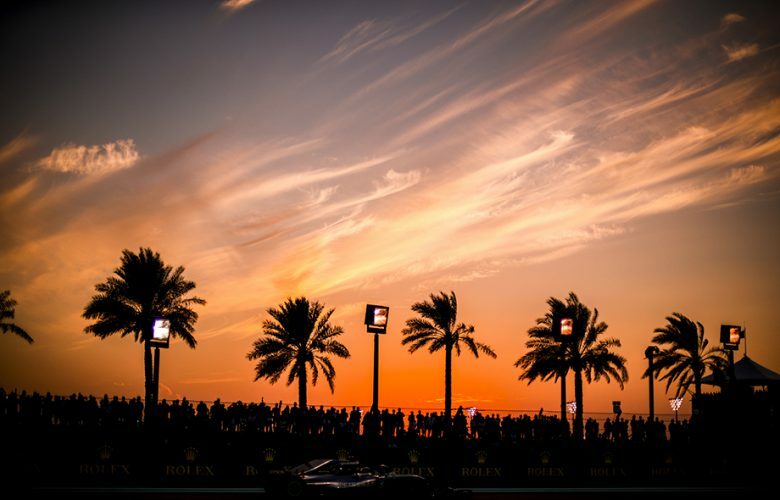 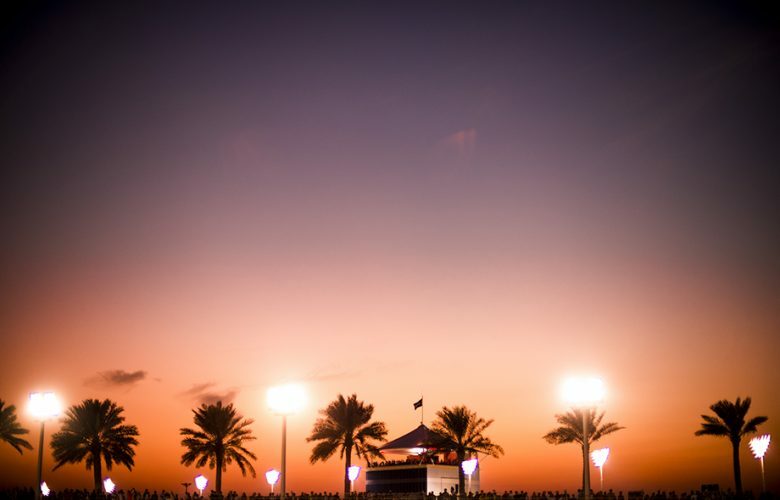 Sun goes down as spectaters follow the qualifying for the Abu Dhabi Formula One Grand Prix at Yas Marina Circuit on November 24, 2018 in Abu Dhabi, United Arab Emirates. Valtteri Bottas of Finland and Mercedes AMG Petronas drives his W09 during qualifying for the Abu Dhabi Formula One Grand Prix at Yas Marina Circuit on November 24, 2018 in Abu Dhabi, United Arab Emirates. Daniel Ricciardo of Australia and Aston Martin Red Bull Racing sparks during qualifying for the Abu Dhabi Formula One Grand Prix at Yas Marina Circuit on November 24, 2018 in Abu Dhabi, United Arab Emirates. 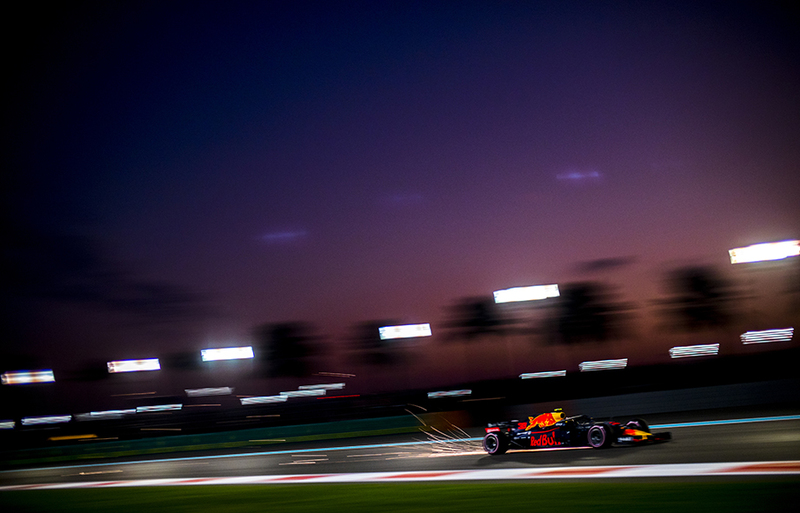 Daniel Ricciardo of Australia and Aston Martin Red Bull Racing drives his RB14 during qualifying for the Abu Dhabi Formula One Grand Prix at Yas Marina Circuit on November 24, 2018 in Abu Dhabi, United Arab Emirates. Lewis Hamilton of Great Britain and Mercedes AMG Petronas drives his W09 during qualifying for the Abu Dhabi Formula One Grand Prix at Yas Marina Circuit on November 24, 2018 in Abu Dhabi, United Arab Emirates. 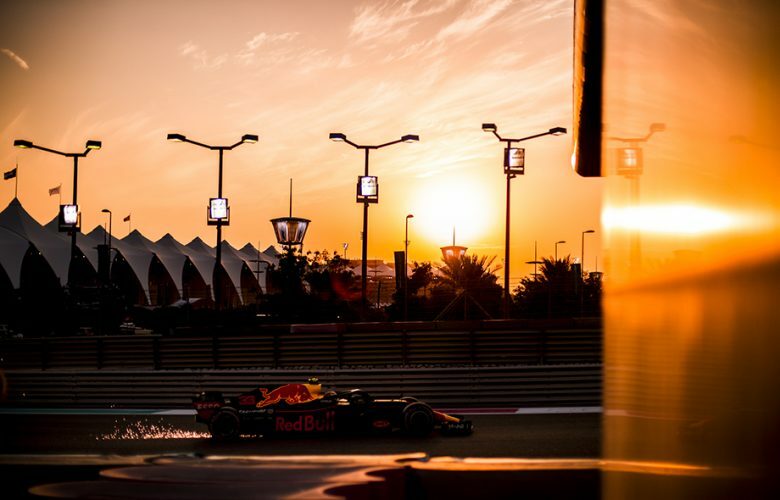 Max Verstappen of Netherlands and Aston Martin Red Bull Racing sparks during qualifying for the Abu Dhabi Formula One Grand Prix at Yas Marina Circuit on November 24, 2018 in Abu Dhabi, United Arab Emirates. 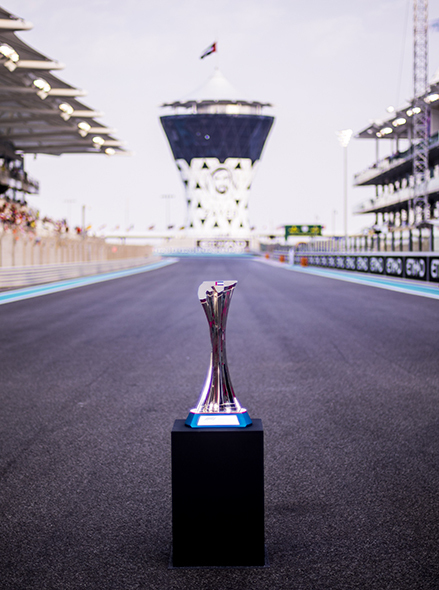 The winner's trophy is presented on the grid ahead of the Abu Dhabi Formula One Grand Prix at Yas Marina Circuit on November 25, 2018 in Abu Dhabi, United Arab Emirates. 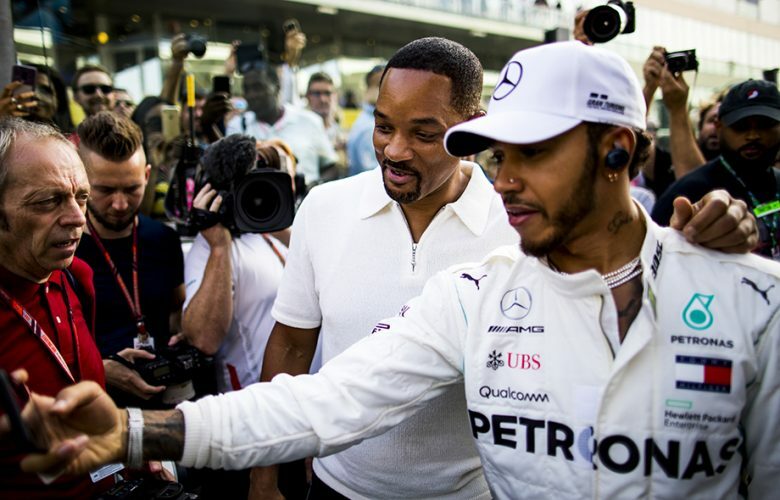 Lewis Hamilton of Great Britain and Mercedes AMG Petronas and Hollywood start Will Smith take a selfie prior to the Abu Dhabi Formula One Grand Prix at Yas Marina Circuit on November 25, 2018 in Abu Dhabi, United Arab Emirates. 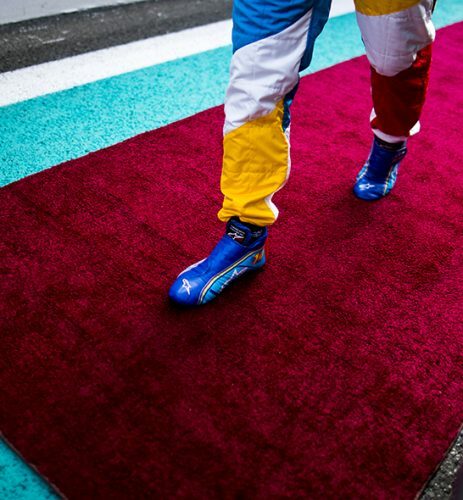 Fernando Alonso of Spain and McLaren walks the red carpet prior to the Abu Dhabi Formula One Grand Prix at Yas Marina Circuit on November 25, 2018 in Abu Dhabi, United Arab Emirates. 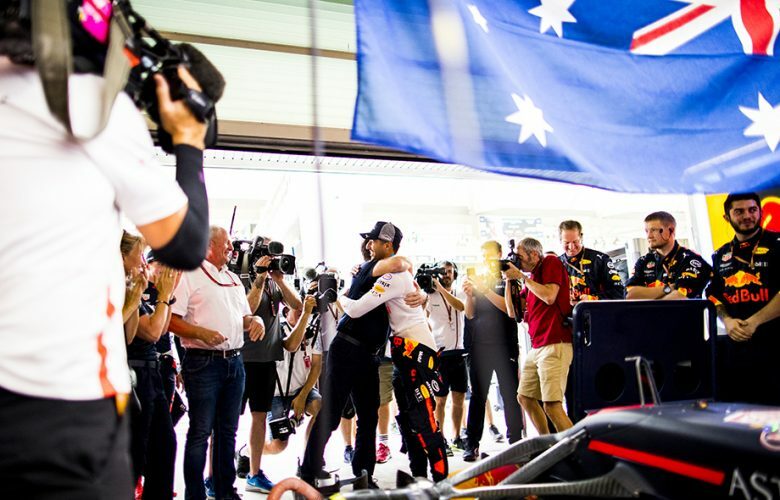 Daniel Ricciardo of Australia and Aston Martin Red Bull Racing gives a hug to Aston Martin Red Bull Racing Team Principal Christian Horner ahead of the Abu Dhabi Formula One Grand Prix at Yas Marina Circuit on November 25, 2018 in Abu Dhabi, United Arab Emirates. 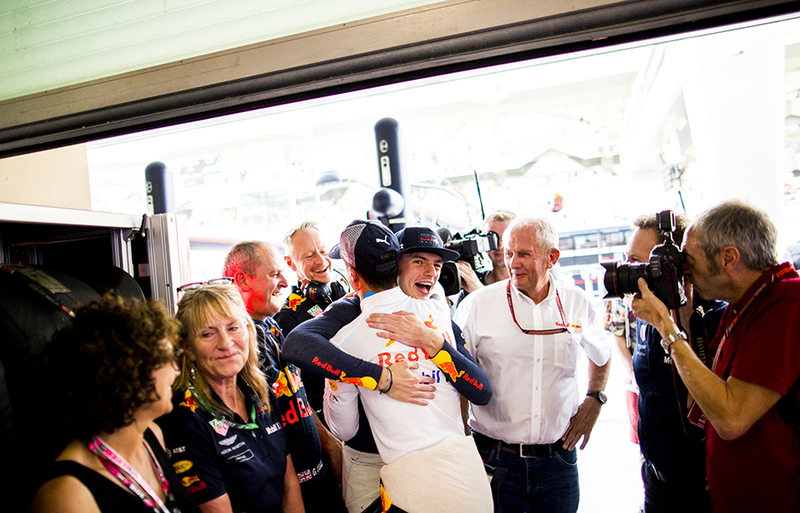 Daniel Ricciardo of Australia and Aston Martin Red Bull Racing gives a hug to his team mate Max Verstappen of Netherlands and Aston Martin Red Bull Racing ahead of the Abu Dhabi Formula One Grand Prix at Yas Marina Circuit on November 25, 2018 in Abu Dhabi, United Arab Emirates. 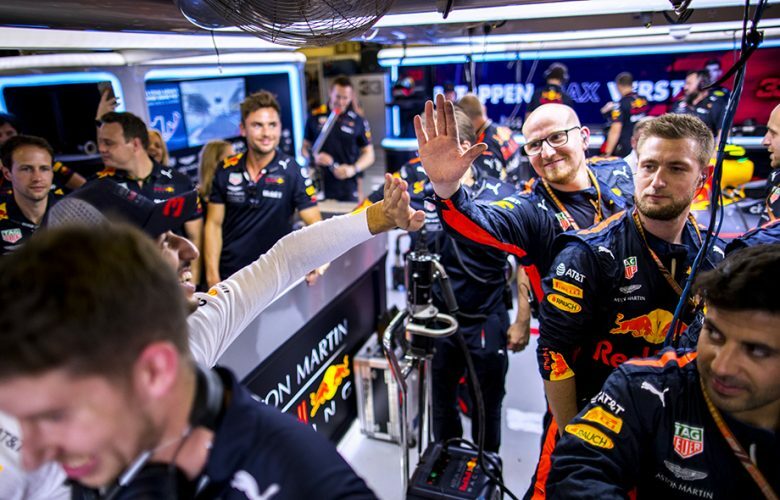 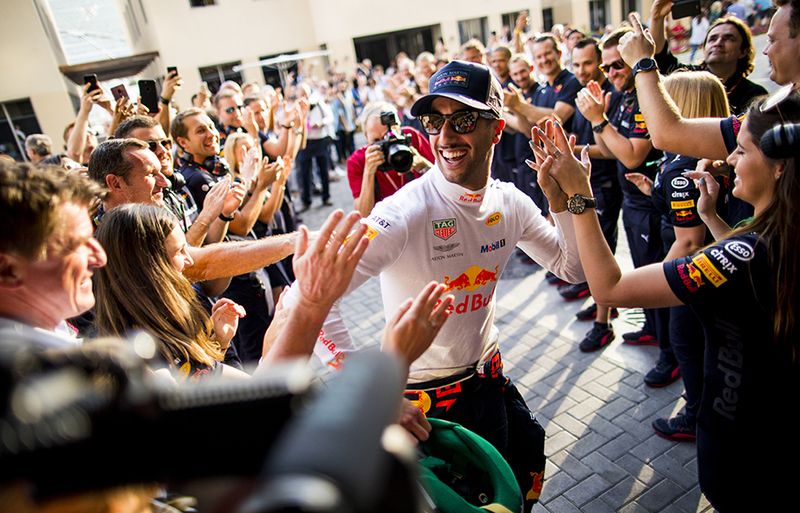 Daniel Ricciardo of Australia and Aston Martin Red Bull Racing high fives team members prior to his final race with the team ahead of the Abu Dhabi Formula One Grand Prix at Yas Marina Circuit on November 25, 2018 in Abu Dhabi, United Arab Emirates. Daniel Ricciardo of Australia and Aston Martin Red Bull Racing steps into his RB14 for his ultimate race for the team prior to the Abu Dhabi Formula One Grand Prix at Yas Marina Circuit on November 25, 2018 in Abu Dhabi, United Arab Emirates. 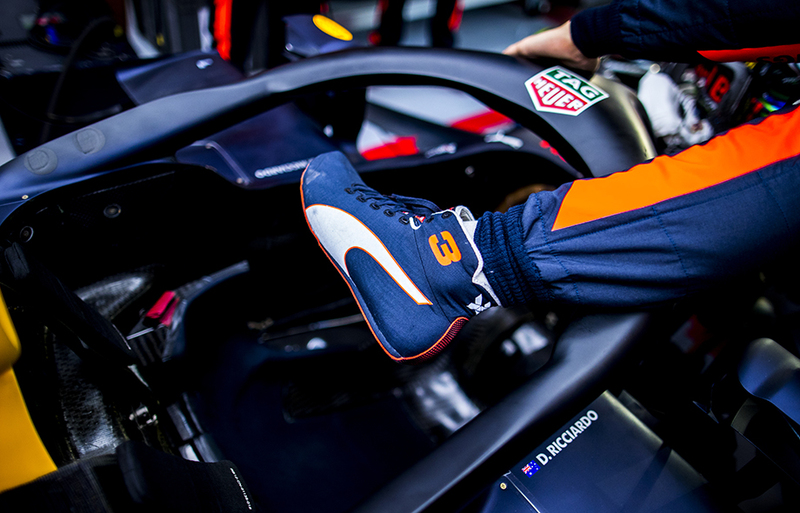 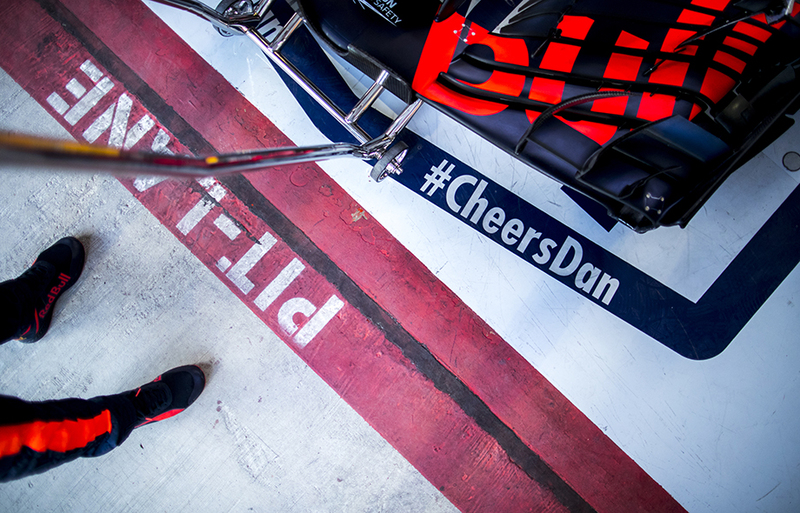 A #CheersDan message is seen on the garage floor as Daniel Ricciardo of Australia and Aston Martin Red Bull Racing prepares to compete in his ultimate race with the team during the Abu Dhabi Formula One Grand Prix at Yas Marina Circuit on November 25, 2018 in Abu Dhabi, United Arab Emirates. 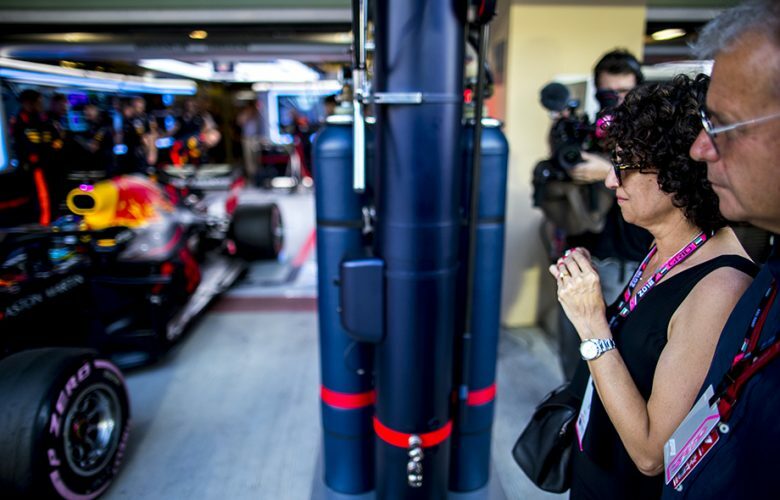 Parents of Daniel Ricciardo of Australia and Aston Martin Red Bull Racing watch him driving out of the garage during the Abu Dhabi Formula One Grand Prix at Yas Marina Circuit on November 25, 2018 in Abu Dhabi, United Arab Emirates. 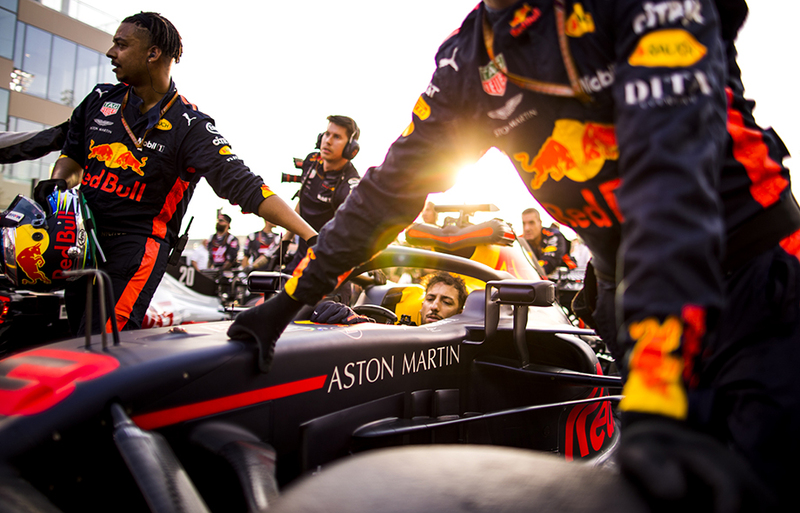 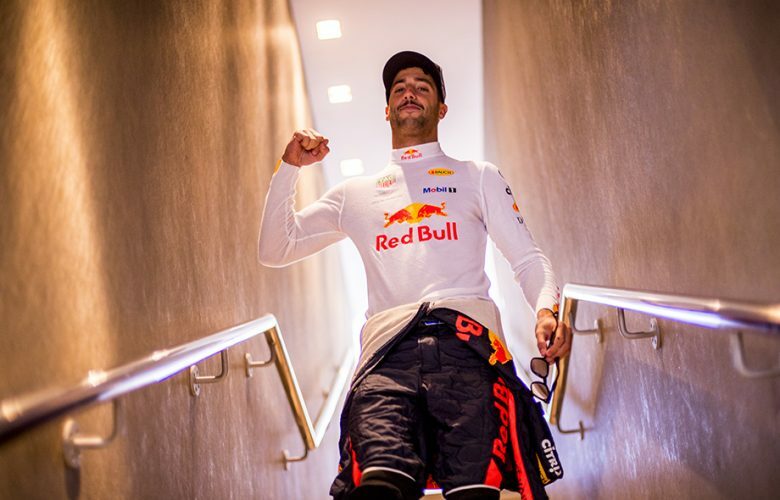 Daniel Ricciardo of Australia and Aston Martin Red Bull Racing arrives on the grid for the Abu Dhabi Formula One Grand Prix at Yas Marina Circuit on November 25, 2018 in Abu Dhabi, United Arab Emirates. 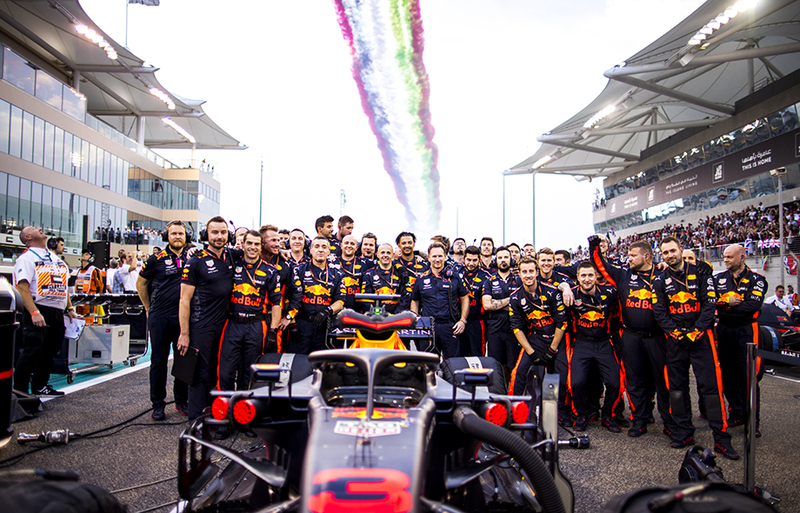 Aston Martin Red Bull Racing team and it's team principal Christian Horner pose for a photo prior to the Abu Dhabi Formula One Grand Prix at Yas Marina Circuit on November 25, 2018 in Abu Dhabi, United Arab Emirates. Max Verstappen of Netherlands and Aston Martin Red Bull Racing steps out of his RB14 ahead of the Abu Dhabi Formula One Grand Prix at Yas Marina Circuit on November 25, 2018 in Abu Dhabi, United Arab Emirates. 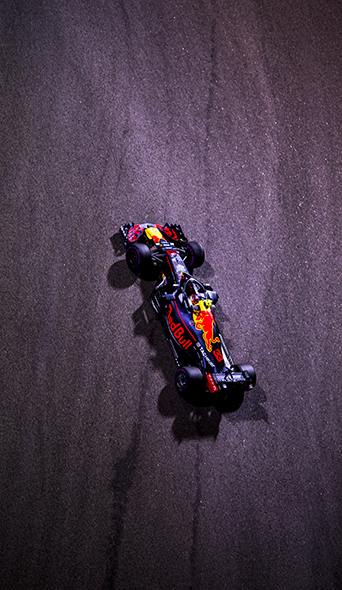 Daniel Ricciardo of Australia and Aston Martin Red Bull Racing drives his RB14 during the Abu Dhabi Formula One Grand Prix at Yas Marina Circuit on November 25, 2018 in Abu Dhabi, United Arab Emirates. 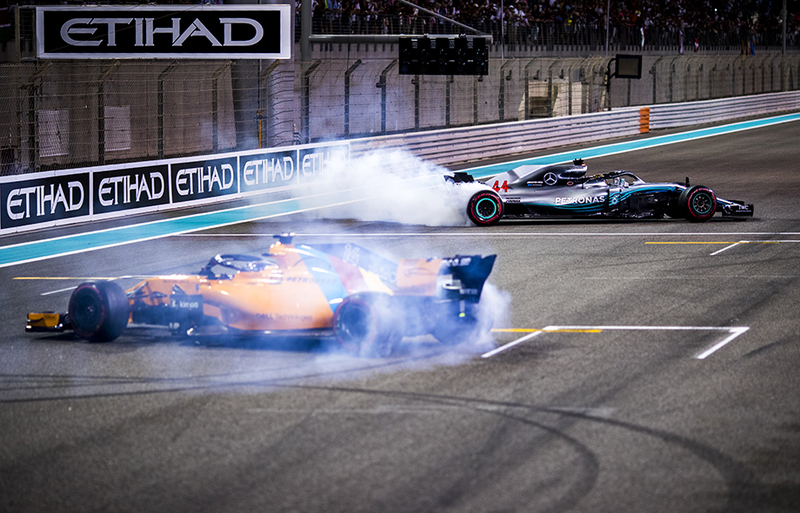 Lewis Hamilton of Great Britain and Mercedes AMG Petronas and Fernando Alonso of Spain and McLaren make donuts following the Abu Dhabi Formula One Grand Prix at Yas Marina Circuit on November 25, 2018 in Abu Dhabi, United Arab Emirates. 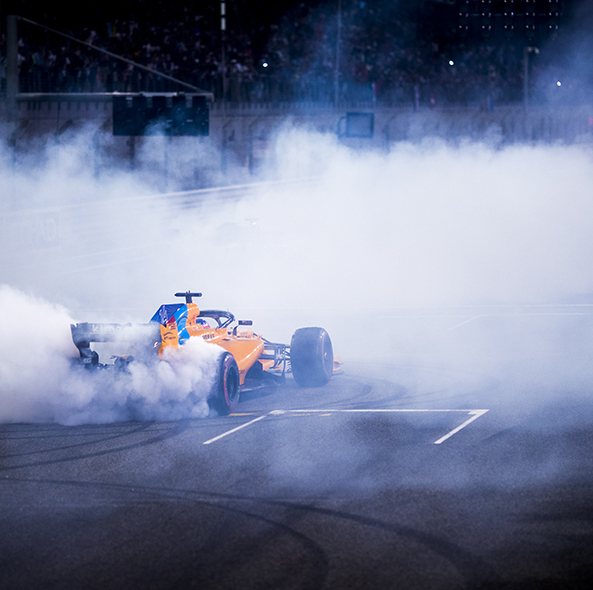 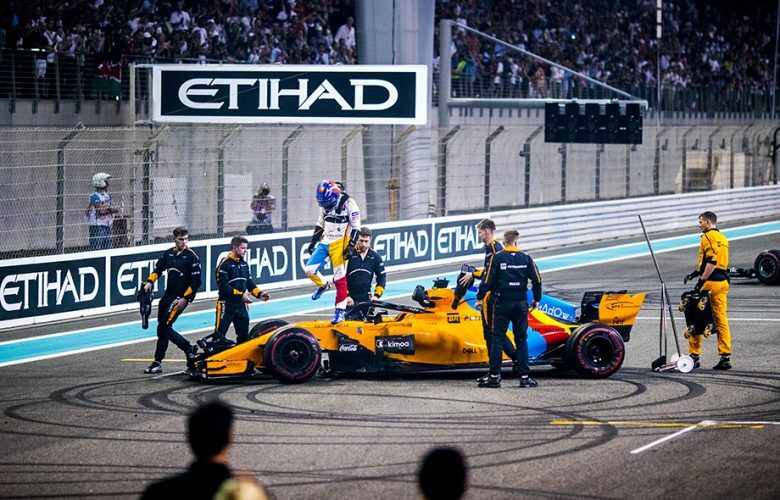 Fernando Alonso of Spain and McLaren makes donuts following the Abu Dhabi Formula One Grand Prix at Yas Marina Circuit on November 25, 2018 in Abu Dhabi, United Arab Emirates. 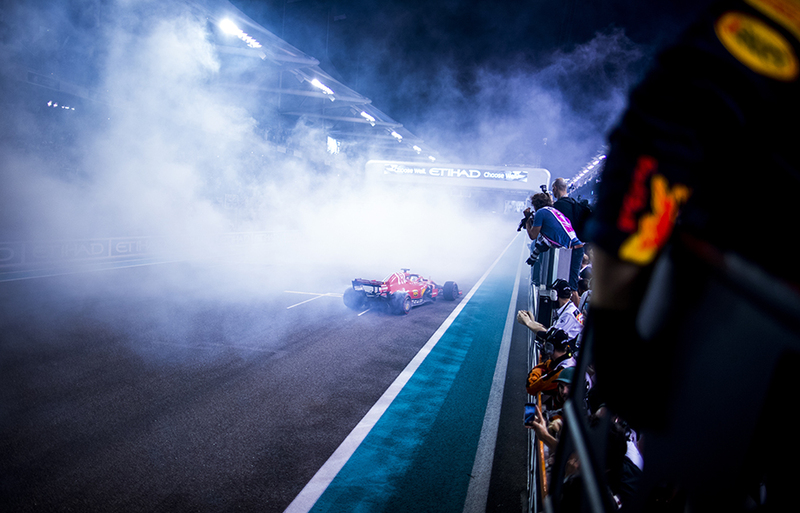 Sebastian Vettel of Germany and Scuderia Ferrari makes donuts along with Fernando Alonso of Spain and McLaren and Lewis Hamilton of Great Britain and Mercedes AMG Petronas following the Abu Dhabi Formula One Grand Prix at Yas Marina Circuit on November 25, 2018 in Abu Dhabi, United Arab Emirates. Fernando Alonso of Spain and McLaren steps out of his McLaren following the Abu Dhabi Formula One Grand Prix at Yas Marina Circuit on November 25, 2018 in Abu Dhabi, United Arab Emirates. 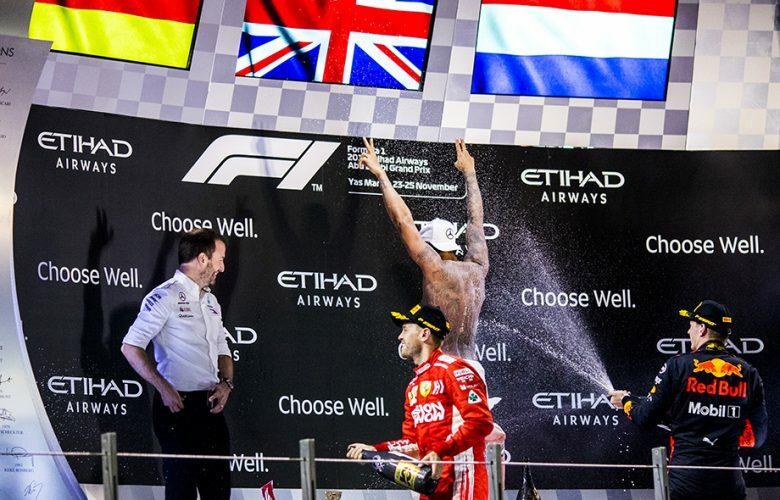 Lewis Hamilton of Great Britain and Mercedes AMG Petronas celebrates following the Abu Dhabi Formula One Grand Prix at Yas Marina Circuit on November 25, 2018 in Abu Dhabi, United Arab Emirates. Lewis Hamilton of Great Britain and Mercedes AMG Petronas celebrates his win as Max Verstappen of Netherlands and Aston Martin Red Bull Racing sprays champagne on his back following the Abu Dhabi Formula One Grand Prix at Yas Marina Circuit on November 25, 2018 in Abu Dhabi, United Arab Emirates. 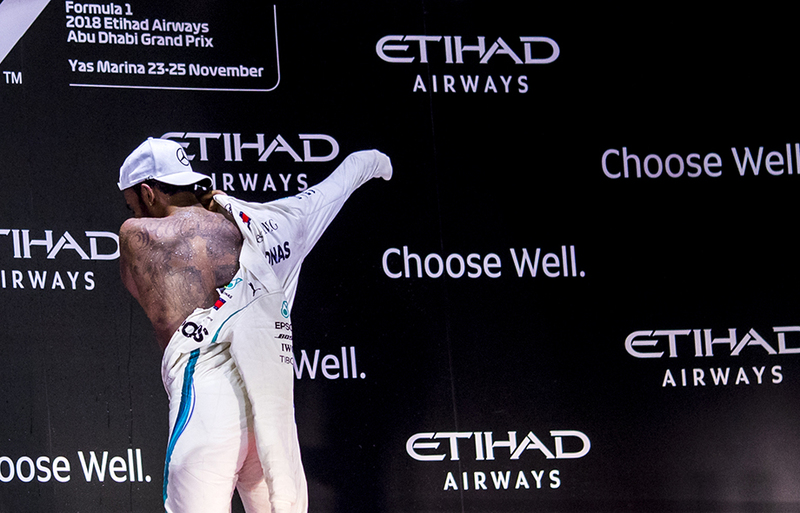 Lewis Hamilton of Great Britain and Mercedes AMG Petronas puts his overall back on after celebrating his win during the Abu Dhabi Formula One Grand Prix at Yas Marina Circuit on November 25, 2018 in Abu Dhabi, United Arab Emirates.